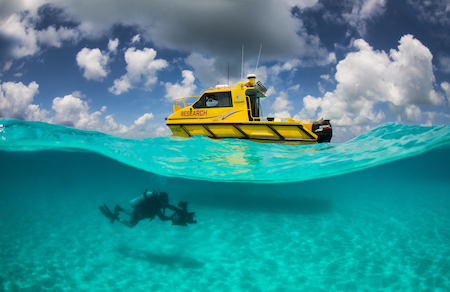 Extensive knowledge of the locations, behaviours and seasonality of the entire reef allows Biopixel to place crew at the right place at the right time. Additionally, Biopixel has strategic partnerships with government agencies and can access traditionally ‘hard to reach’ locations and research projects. In 2017 we launched our flagship vessel ARGO, a 27m liveaboard motor yacht, accommodating up to 16 passengers and with a cruising range of 3000 nautical miles. Argo supports Biopixel’s research projects and media production accommodating large film crews for long range trips. Argo Expeditions also conducts dive charters and research expeditions on the Great Barrier Reef and surrounding areas, visiting some of the most remote and unique dive sites in the region. We have a variety of ready made 1, 3 and 6 day trip itineraries that you can choose from or contact us directly to tailor an itinerary to suit your specific requirements and destinations. In 2015 Biopixel acquired a 7.5m commercial vessel to support its research and stock footage acquisition projects. The vessel can support up to 5 passengers and has the necessary permits and registrations to perform commercial dive, research and filming operations in the region.